SciChart Android ships with ~60 Android Chart Examples which you can browse, play with, view the source-code and even export each SciChart Android Chart Example to a stand-alone Android Studio project. All of this is possible with the new and improved SciChart Android Examples Suite, which ships as part of our Android Charts SDK. – FastFixedErrorBarsRenderableSeries which can be used to render an XyDataSeries (which contains one X-point and one Y-point), XyyDataSeries (renders Y values), XyzDataSeries, HlDataSeries and OhlcDataSeries(renders Close values). Error values are fixed and specified by calling setErrorLow() and setErrorHigh methods. Do you need to change the width of a error bar? Try calling the setDataPointWidth() method passing in any number from 0.0 to 1.0. This alters how much space the bar takes up. The full source code for the Android Error Bars Chart example is included below (Scroll down!). Did you know you can also view the source code from one of the following sources as well? Clone the SciChart.Android.Examples from Github. 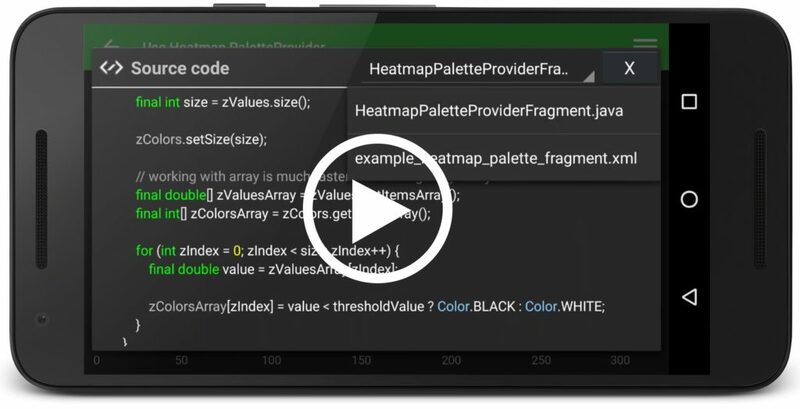 Or, view source and export each example to an Android Studio project from the Java version of the SciChart Android Examples app. Also the SciChart Android Trial contains the full source for the examples (link below). // SCICHARTÂ® Copyright SciChart Ltd. 2011-2017. All rights reserved. // code whether for commercial, private or personal use.